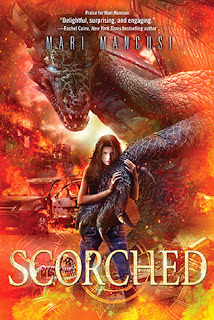 Recommended to: Readers who love action and adventure mixed with dragons! What is my favorite mythical creature, you ask? The answer would definitely have to be dragons. I love everything about them, from their scaly hides to their impressive wingspan. Maybe it's because of my addiction to Fantasy, but I'm a dragon fan! Needless to say, I was extremely excited to read Scorched. I already love Mari Mancusi's writing, but then adding in dragons? That's a win in my book! The first third of the book knocked my socks off. I adored Trinity from the start, and I loved that she was so close with her grandfather. Mancusi slowly built up a story where a boy from the future, and a girl from the present were intertwined in an amazing way. Connor has been sent back to get rid of the threat that will lead to the apocalypse in his time, but once he meets Trinity he just can't shake his feelings for her. Sound slightly sweet? I'd agree! I loved Trinity and Connor during this part of the book, and the added action kept me reading on. Then Caleb came into the picture and things changed. I can't really explain too much without spoiling things for potential readers, but the twin aspect is a little weird. Caleb is supposed to be the exact opposite of Connor but, in all honesty, they are pretty similar. I was introduced to the Draken, to the Nether, and to the way dragons were born. So much squished into one part of the book made the ending feel more than a little rushed. If only the ending had been as well done as the beginning, I would have given this a much higher rating. I enjoyed the world building, liked the characters, and of course loved the dragons. It was really the pacing that was off. I'm willing to forgive a lot, since this is the first book in the series. Truth be told, I know for a fact I'll be back to read more of Trinity's story. I can't wait to see what happens to her, to Connor (who is my favorite by the way) and to the dragons. A bit of a slow start, but I know things will pick up. Bring on more dragons!